THE result was made official on Thursday when the Electoral Commissioner officially called the election and named Cr Andrew Antoniolli the winner. ALMOST 100,000 votes from Saturday's mayoral by-election have been counted. The latest figures on the Electoral Commission Queensland website show Cr Andrew Antoniolli has maintained his lead as postal votes continue trickling in. So far, 99,147 (82.18%) ballot papers have been counted. 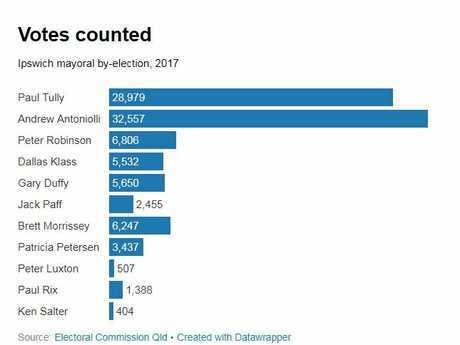 Of those, 3,321 were 'informal votes' meaning the paper was not filled out correctly and these peoples' votes did not go toward deciding Ipswich's new mayor. At the time the rolls closed, 120,648 people were enrolled to vote in the by-election. A formal election result if yet to be announced. And in sixth place, Dallas Klass on 5.89%. MOST of the votes from Saturday's Ipswich mayoral election have been counted with Electoral Commission Queensland (ECQ) workers getting stuck into the postal votes today. A total of 96,647 votes had been counted at 9.50am this morning - that includes postals, pre-polls and all other votes. A tally of 91 689 people voted in person at either booths, pre-polls, electoral visits, declared institutions, telephone votes and other kinds of votes. ECQ officers visited hospitals and nursing homes prior to the election. Postal votes can come in until August 29. A total of 4960 postals have been counted so far. The election is unlikely to be declared until the end of the week. That declaration will be made by Ipswich returning officer Peter Gordon after being given the green light to declare by the ECQ. Cr Andrew Antoniolli is in an unassailable lead with 80.11% of the electoral role of 120, 648 people. Cr Antoniolli is on 32,367 votes, 34.67% of the total. He is ahead of Acting Mayor Paul Tully on 28,776 votes (30.83%). It appears likely that by the final count over 100,000 electors of those 120,000-plus will have cast their votes. After all postals are in and check counts are done the preferences will be allocated. Many of those preferences will exhaust and they will not have an influence on the final outcome. LEADING mayoral candidate Cr Andrew Antoniolli has maintained his lead on Cr Paul Tully as the counting resumed today. The Electoral Commission Queensland has counted declared institution, and some postal, votes this morning. The updated results have Cr Antoniolli leading Cr Tully by 3555 votes, slightly narrowing last night's gap of 3,646 votes between them. Counting of postal votes won't finish until August 29 when the last ballots are due back. Cr Antoniolli leads with 34.67%, compared to Cr Tully's 30.86%. Postal votes will continue to trickle in for the next few days. NO new results have been published since last night but Cr Tully is unlikely to catch leading candidate Cr Antoniolli. About 8000 postal votes are yet to be counted and only 3,646 votes between the top two rivals. Postal votes aren't due back until August 29, but at those odds it is unlikely the trend seen so far will change. Cr Antoniolli celebrates on Saturday night at the Showgrounds with family and friends. More than 3000 Ipswich residents wasted their vote. So far 90,906 votes have been counted but only 87,639 of those votes went towards deciding who would be the city's next mayor. The ECQ website shows there were 3,267 informal votes which means more than 3000 people did not fill out their ballot paper correctly. 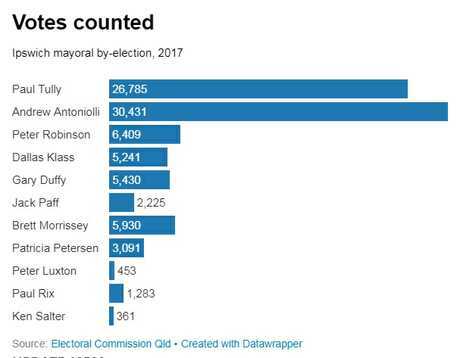 That is significantly higher than the last time Ipswich residents went to the polls to vote in a new mayor in 2016, when Paul Pisasale won in a landslide against Peter Luxton and Gary Duffy. During the 2016 mayoral election, there were 2,979 informal votes, or 3.07%. 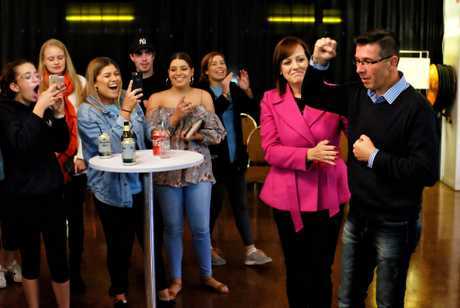 Mr Pisasale retained his position with a whopping 83.45% compared to the 34.72% Cr Antoniolli has secured so far, (Cr Tully has 30.56% of the vote). CRUCIAL results from the Ipswich pre-poll centre have been counted. Cr Antoniolli has a clear lead on key rival Cr Tully. A count check will be carried out tomorrow. ECQ spokesperson Nicole Butler says the earliest a result can be declared is Sunday afternoon, but postal votes are yet to be counted. Results at 10pm last night. THE Electoral Commission Queensland says key pre-poll votes from the Ipswich booth will be counted tonight. But ECQ spokesperson Nicole Butler warns it may be days before a result can be formally declared. NO victory has been declared yet by Cr Antoniolli who has a lead on key opponent Cr Paul Tully. Cr Antoniolli said his own vote in Cr Tully's heartland had proved crucial and that his chief opponent had missed the sentiment of the public. "Two weeks ago I wasn't in it. 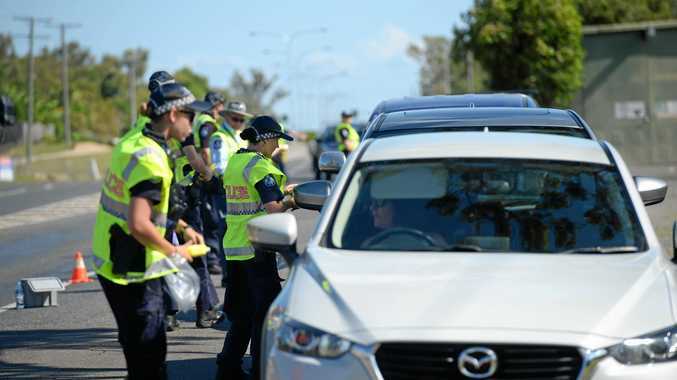 So we decided to have a big push in that Springfield and eastern area - everywhere east of Bundamba Creek," he said. "My team felt that we were very solid west of Bundamba Creek but that Tully had the name recognition on the eastern side. "I felt I had to appeal to those people with the things that I knew the people this western side of Bundamba Creek knew about me - that I am all about families, transparency and integrity. "I think that the interesting thing is that with 11 candidates a lot of Tully's vote at Goodna, even though he polled well, was decimated by myself and the other candidates. "It was a very windy day today and maybe the winds have changed. "Maybe people have started to see through the veneer of Cr Tully and that there are some things about Cr Tully that aren't resonating. "One thing he did not get was the public sentiment that has been around the last eight weeks. He completely missed that business as usual is not going to cut it. Transparency, openness and a new way of running council is the way forward. He completely missed the boat with that. "It doesn't matter what the end result is. Regardless of whether he gets 30% or 35% or whatever, nearly 70% of the people of Ipswich are saying that council needs to be more transparent." CRITICAL booths in this election include Leichhardt, North Ipswich, Raceview, Redbank, Redbank Plains, Rosewood and all the Springfield booths. Results have shown up for all those booths which have Antoniolli ahead at Leichhardt, Raceview and Rosewood. Tully was miles ahead at Redbank, Redbank Plains, Kruger and the Springfield booths. Cr Tully needed to hold his own west of Bundamba Creek to win, but it is in those areas where Cr Antoniolli has doubled his chief opponent's vote. Cr Antoniolli romped home in Raceview with 37.75% of the vote compared to Cr Tully's 20.03%. It was even worse for Cr Tully in Brassall West where he was able to win just 17.53%. Cr Antoniolli won 47.76% to romp home. In Karalee Cr Antoniolli has been dominant again with 42.25% of the vote, against Cr Tully's 21.9%. In the west Cr Antoniolli is on fire with 35.96% in Rosewood to Cr Tully's 19.82%. Cr Antoniolli hasn't declared victory yet saying the Ipswich pre-poll count will be critical. But he says achieving at least 20% of the vote Goodna and the Springfield pre-poll is a "good result". KEY booth Brassall has been counted and the results show Antoniolli has managed to secure a lead in that area. He is ahead of major rival Cr Paul Tully with Cr Andrew Antoniolli securing 38.57% of the vote compared 23.21% top Tully. Overall, Cr Antoniolli is sitting on 36.36%, followed by Cr Tully on 27.28% followed closely by Peter Robinson, Dallas Klass and The Greens candidate Brett Morrissey. Votes are in for the Ipswich mayoral election: Votes are being counted for the Ipswich mayoral election. COUNCILLOR Andrew Antoniolli is leading the race so far as the results have begun to come in. Key booths are yet to be counted in Brassall, North Ipswich, Raceview, Leichhardt and Springfield (three booths). THE polls have closed and now the count begins. There are 120,408 people enrolled to vote in Ipswich. Exit polls conducted by the QT at three different polling booths earlier today suggest this will be a two-horse race. That was also reflected in various opinion polls conducted throughout the campaign period with councillors Paul Tully and Andrew Antoniolli leading the pack. This election, 11 mayoral hopefuls entered the race for the city's top job. But only one can emerge victorious. The QT will post the election results below as they roll in. Ipswich returning officer for the ECQ Peter Gordon has explained how the process will unfold tonight. "We are counting Bundamba pre-poll first, and that is about 3900. Then we are doing Springfield which is about another 3400 and then we will do Ipswich pre-poll," Mr Gordon said. "All up there are 16,480 ballot papers in those three boxes. "The figures from the (44) polling booths are phoned in during the night and I will enter those in the direct data and that will go straight up (online). "We will load the data as it comes in. "We have a tally screen which will give us a picture of where we are with the results." Mr Gordon said he would look at how things were going at 10pm to determine whether the count resumed tomorrow. "We should get it all done because we have an army of people," he said. Mr Gordon said there would not be a result tonight. "We have still got postals to count, over 5000," he said. "The postals have 10 days to come in so the last count will be on August 29. "It all depends on the mood of the voters and how they voted today whether we get an early result." Polling by Galaxy and ReachTEL before the election suggested only two candidates could win; Acting Mayor Paul Tully and Cr Andrew Antoniolli. Watch the live coverage from Phoenix Media Hub, USQ Springfield Tally Room. The show will be hosted by Spencer Howson and QT editor Shannon Newley. The most recent Galaxy poll had Cr Tully ahead on 36% and Cr Antoniolli close behind on 30%. Next best was Peter Robinson on 9%. We spoke to a few of the candidates after the polling booths closed.